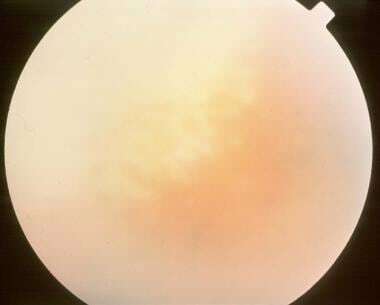 Acute retinal necrosis (ARN) can lead to uveitis, retinal detachment, and blindness. Acute retinal necrosis was first described in the Japanese literature in 1971 and termed Kirisawa uveitis. During the past 3 decades, acute retinal necrosis syndrome has been a source of fear, frustration, and fascination for many ophthalmologists. Unfortunately, it can be a visually devastating condition for the patient. A necrotic retina is shown in the image below. The white area is necrotic retina. Acute retinal necrosis may be a result of dormant herpes simplex virus 1 (HSV-1), herpes simplex virus 2 (HSV-2), cytomegalovirus, or varicella-herpes zoster virus (VZV) viral reactivation in the retina. The exact etiology of this reactivation is still elusive; however, an immunogenetic predisposition to the disease is likely. In Switzerland, acute retinal necrosis accounts for 1.7% of uveitic cases. Significant visual loss may occur. Retinal detachment is a frequent complication (~50%) [2, 3, 4] and is a cause of legal blindness in some bilateral cases of acute retinal necrosis. This condition appears to have a predilection for males; however, the extent is not clear. Acute retinal necrosis is a disease of young healthy individuals aged 20-50 years. A bimodal age distribution possibly exists, peaking at approximately ages 20 and 50 years. This distribution may be related to differences in etiologic agents. When varicella-zoster virus or herpes simplex virus type 1 is involved, the median age is 57 and 47 years, respectively. When herpes simplex virus type 2 is involved, the median age is 20 years. Muthiah MN, Michaelides M, Child CS, Mitchell SM. Acute retinal necrosis: a national population-based study to assess the incidence, methods of diagnosis, treatment strategies and outcomes in the UK. Br J Ophthalmol. 2007 Nov. 91(11):1452-5. [Medline]. [Full Text]. Lau CH, Missotten T, Salzmann J, Lightman SL. Acute retinal necrosis features, management, and outcomes. Ophthalmology. 2007 Apr. 114(4):756-62. [Medline]. Usui Y, Takeuchi M, Goto H, Mori H, Kezuka T, Sakai J. Acute retinal necrosis in Japan. Ophthalmology. 2008 Sep. 115(9):1632-3. [Medline]. Tibbetts MD, Shah CP, Young LH, Duker JS, Maguire JI, Morley MG. Treatment of acute retinal necrosis. Ophthalmology. 2010 Apr. 117(4):818-24. [Medline]. Wensing B, de Groot-Mijnes JD, Rothova A. Necrotizing and nonnecrotizing variants of herpetic uveitis with posterior segment involvement. Arch Ophthalmol. 2011 Apr. 129(4):403-8. [Medline]. Ryan SJ, Schachat AP, Wilkinson CP, Hinton DR, Sadda SR, Wiedemann P. Retina. 5th ed. 2013. Walters G, James TE. Viral causes of the acute retinal necrosis syndrome. Curr Opin Ophthalmol. 2001 Jun. 12(3):191-5. [Medline]. Moesen I, Khemka S, Ayliffe W. Acute retinal necrosis secondary to herpes simplex virus type 2 with preexisting chorioretinal scarring. J Pediatr Ophthalmol Strabismus. 2008 Jan-Feb. 45(1):59-61. [Medline]. Crapotta JA, Freeman WR, Feldman RM, Lowder CY, Ambler JS, Parker CE, et al. Visual outcome in acute retinal necrosis. Retina. 1993. 13 (3):208-13. [Medline]. Duker JS, Blumenkranz MS. Diagnosis and management of the acute retinal necrosis (ARN) syndrome. Surv Ophthalmol. 1991 Mar-Apr. 35(5):327-43. [Medline]. Holland GN. Standard diagnostic criteria for the acute retinal necrosis syndrome. Executive Committee of the American Uveitis Society. Am J Ophthalmol. 1994 May 15. 117(5):663-7. [Medline]. Sergott RC, Belmont JB, Savino PJ, Fischer DH, Bosley TM, Schatz NJ. Optic nerve involvement in the acute retinal necrosis syndrome. Arch Ophthalmol. 1985 Aug. 103(8):1160-2. [Medline]. Blumenkranz MS, Culbertson WW, Clarkson JG, Dix R. Treatment of the acute retinal necrosis syndrome with intravenous acyclovir. Ophthalmology. 1986 Mar. 93(3):296-300. [Medline]. Aizman A. Treatment of acute retinal necrosis syndrome. Drugs Today (Barc). 2006 Aug. 42(8):545-51. [Medline]. Aizman A, Johnson MW, Elner SG. Treatment of acute retinal necrosis syndrome with oral antiviral medications. Ophthalmology. 2007 Feb. 114(2):307-12. [Medline]. Emerson GG, Smith JR, Wilson DJ, Rosenbaum JT, Flaxel CJ. Primary treatment of acute retinal necrosis with oral antiviral therapy. Ophthalmology. 2006 Dec. 113(12):2259-61. [Medline]. Khurana RN, Charonis A, Samuel MA, Gupta A, Tawansy KA. Intravenous foscarnet in the management of acyclovir-resistant herpes simplex virus type 2 in acute retinal necrosis in children. Med Sci Monit. 2005 Dec. 11(12):CS75-8. [Medline]. Palay DA, Sternberg P Jr, Davis J, Lewis H, Holland GN, Mieler WF. Decrease in the risk of bilateral acute retinal necrosis by acyclovir therapy. Am J Ophthalmol. 1991 Sep 15. 112(3):250-5. [Medline]. Hillenkamp J, Nolle B, Bruns C, Rautenberg P, Fickenscher H, Roider J. Acute retinal necrosis: clinical features, early vitrectomy, and outcomes. Ophthalmology. 2009 Oct. 116(10):1971-5.e2. [Medline]. Cochrane TF, Silvestri G, McDowell C, Foot B, McAvoy CE. Acute retinal necrosis in the United Kingdom: results of a prospective surveillance study. Eye (Lond). 2012 Mar. 26 (3):370-7; quiz 378. [Medline]. Kim SJ, Lo WR. Acute retinal necrosis. Ophthalmology. 2008 Jun. 115(6):1104-5; author reply 1105-6. [Medline]. Nussenblatt RB, Palestine AG. Acute retinal necrosis. Uveitis: Fundamentals and Clinical Practice. 1989. 407-14. Park SS, Holz HA, Ravage ZB, Merrill PT, Nguyen QD. Diagnostic and therapeutic challenges. Acute retinal necrosis syndrom. Retina. 2008 Apr. 28(4):660-4. [Medline]. Severe vitritis with occlusive arteriolitis.